Karen Chace - Catch the Story Bug! : Dragons - Mythical, Mystical, Magical Creatures! Dragons - Mythical, Mystical, Magical Creatures! Dragons have filled our myths, legends, history and imaginations for centuries. The Scandinavians described swimming dragons and the Vikings placed dragons on the front of their ships to scare off the sea monsters and myths containing dragons date back to 4000 B.C. Marco Polo wrote of his travels to the province of Karajan and reported on huge serpents, which at the fore part have two short legs, each with three claws. Records of the Greek historian Herodotus and the Jewish historian Josephus describe flying reptiles in ancient Egypt and Arabia, and in art, dragons appear on ancient pottery in China as late as 202 A.D.
o In some cultures dragons have major spiritual significance. o In many Asian cultures dragons represented the primal forces of nature, religion and the universe. o They are associated with wisdom and often said to be wiser than humans. o They are often associated with wells, rain, and rivers. o European dragons are usually depicted as evil. o Chinese dragons do not have wings but have very long tails. They are benevolent and can take on human form. The Imperial Dragon is the combination of four benevolent spiritual animals, the other three being the phoenix, the unicorn and the tortoise. 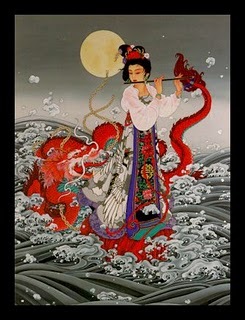 o Japanese dragons are water deities associated with rainfall and bodies of water. o Persians believed a dragon's baby would be the same color as the mother's eyes. o Scottish dragons have two tails. Activity Village – Lots of crafts and printables as well. Chinese Dragon Puppet – Makes a great bookmark as well. San Diego Zoo - The Lifestyle of the Komodo Dragon - For grades 4 – 6; facts, activities and more on this interesting and ancient creature. Draconian.com - The history of dragons in various cultures, short legends about dragons and more. This blog post was painstakingly researched and compiled by Karen Chace. Permission for private use is granted. Distribution, either electronically or on paper is prohibited without my expressed written permission. For permission please contact me at storybug@aol.com. Of course, if you wish to link to my blog or newsletter via your website, blog, newsletter, Facebook page or Twitter please feel free to do so; I greatly appreciate your support and personal integrity. Thanks for you kind comment. Actually, your favorite story is there, put it is on the website, The Serene Dragon on the blog post. That site lists over 544 dragon tales by country and your favorite is there. I am a wooden dragon, which is 'better' than some of the other dragons! And I have a two foot long dragon that is in my office watching over me! A little extra factoid. According to Joseph Campbell, European dragons are generally associated with greed. That's why they're often depicted as guarding vast treasure hoards or beautiful maidens. Two things they really don't have any use for, but still seem to want anyway.